You know that spring has sprung when you see the bright yellow blaze of forsythia blossoms across the neighborhood. Forsythia is a shrub that barely gets noticed until spring arrives, and then it’s the star of the show! I was pleasantly surprised and excited to find out that forsythia flowers are edible, especially since I knew that my neighbor has an enormous forsythia shrub. 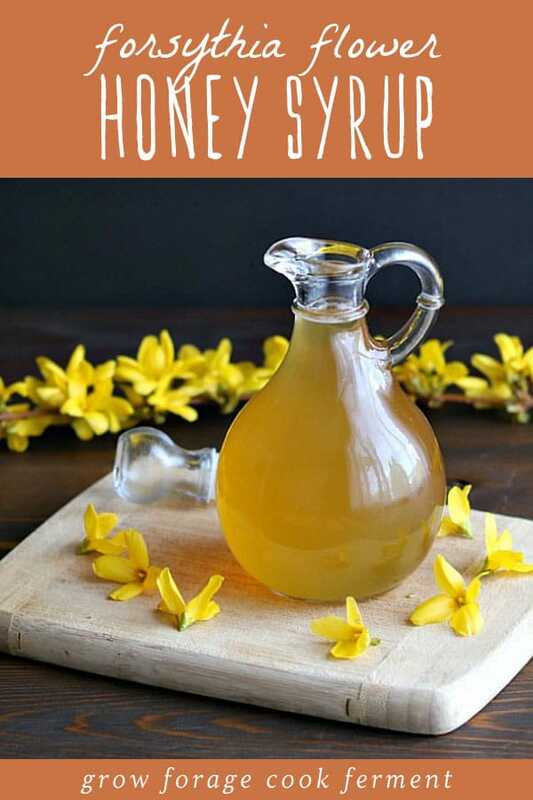 I decided to make a forsythia syrup made with honey that is amazingly delicious! 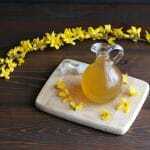 Before you make this syrup, you will first need to collect some yellow forsythia blossoms. You don’t need a lot, just about one cup, and they are easy to harvest. They pop right of the stem with just a little pinch! If you don’t have a forsythia shrub in your yard, someone in your neighborhood probably does! Be sure to get permission before collecting, and be extra careful that it isn’t in an area with toxic road runoff or herbicide/pesticide use. Learn more about growing forsythia and its medicinal uses here. I’ve seen recipes for forsythia syrup before, but every one uses regular sugar, and I try to stay away from that as much as possible. I’ve made other syrups with honey, like elderberry syrup, so I knew that would work well here, too. This forsythia syrup is a beautiful yellow color and tastes like spring! It would be perfect on pancakes or stirred into tea. It’s pretty enough to serve for company, so make this recipe for your next brunch party! 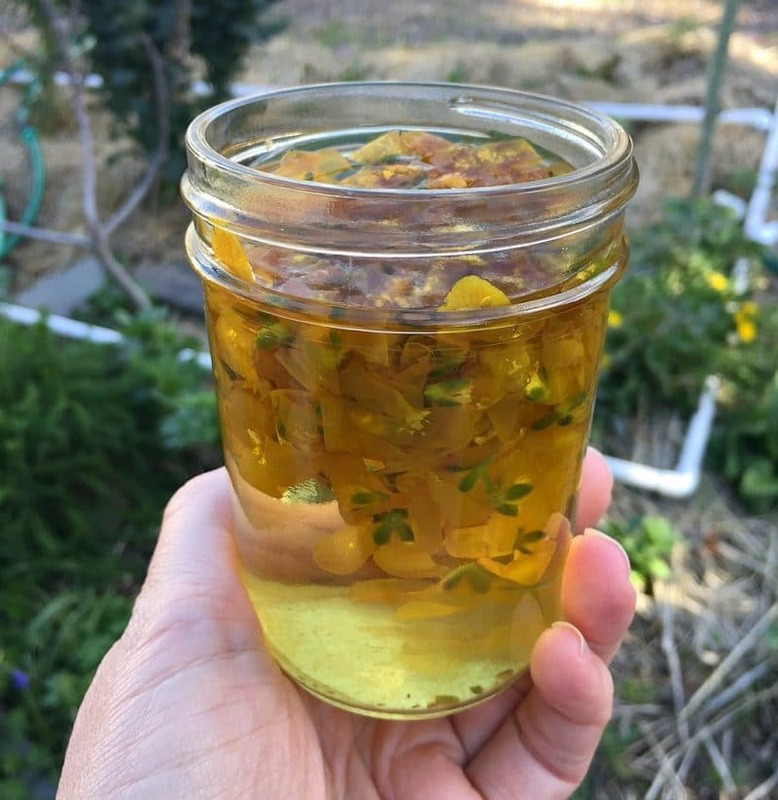 Some other fun recipes you can make with forsythia flowers are this Forsythia Dandelion Jelly or even this Forsythia Soap! I love using edible flowers in recipes, like my Lemon Lavender Shortbread or Violet Flower Infused Vinegar. It keeps me in tune with the seasons, and adds a nice floral flavor and scent that you really can’t get anywhere else. 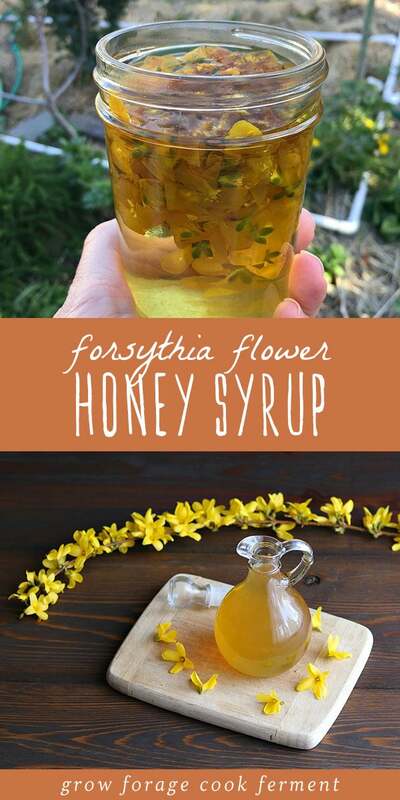 This forsythia honey syrup is no exception! 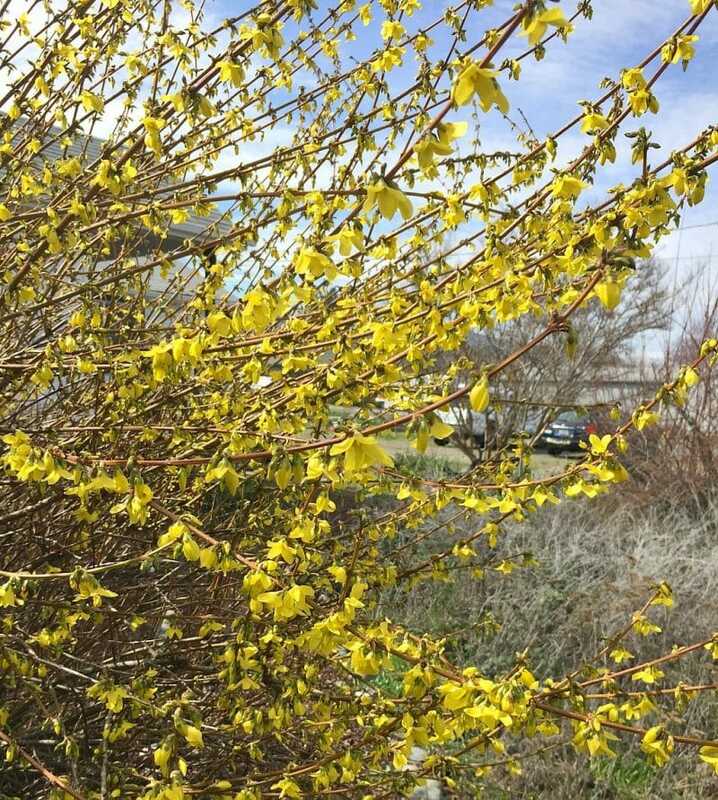 The blooming bright yellow flowers of the forsythia shrub is one of the first signs of spring, but not everyone knows that the blossoms are edible! 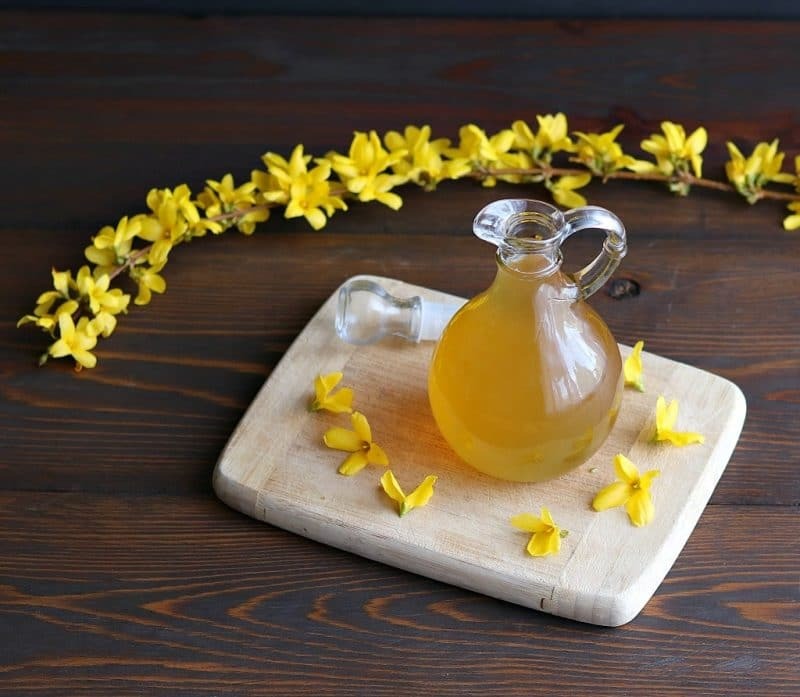 Make this forsythia syrup with honey for a delicious spring treat. Put the forsythia flowers in a half pint jar. Bring the water to a boil and pour over the flowers. Let the flower tea steep for several hours or overnight, until it has completely cooled to room temperature. Strain the flowers, then stir the honey into the tea. Add more or less honey to taste depending on desired sweetness level. Store in the refrigerator and it will keep for 3-4 weeks. Serving size is approximately 1 tablespoon. I live in Ireland and I’m looking to plant this particular shrub. I see that thers is the forsythia suspensa and the f. .intermedia. Are both of these for medicinal uses? native to China and has been cultivated in China and Japan for a considerable time.Forsythia suspensa was long considered to be a parent of the widely planted hybrid grown under the name of Forsythia x intermedia , but F. intermedia is now considered to be a true wild Chinese species. Weeping forsythia is the source of the Traditional Chinese Medicine (TCM) ‘Lián Qiáo’, and is mentioned in some of the earliest Chinese medical texts dating back at least 4,000 years. It is often prescribed in combination with other plants in TCM, and has various uses there and in herbal medicine generally. A decoction of the fruit is used to treat boils and other skin infections, to treat intestinal worms, and to control menstruation. The roots are used to treat colds, fever and jaundice, and a decoction of the leaves and twigs is used to treat breast cancer. Laboratory studies have confirmed its anti-tumour, anti-bacterial and anti-inflammatory activities. It can tolerate partial shade, but flowers best in full sun. Flowers are borne on the previous year’s wood, so any pruning should be done immediately after flowering to ensure blooms are produced the following year. Older plants, that may have become untidy, can be cut back to one-third to promote young growth (rejuvenation). That’s incredible! thanks for sharing! Fantastic! I’ve been looking for ideas to use forsythia ever since I read about some of its medicinal properties. Question though; can you use any forsythia variety or only specific ones? I just want to be 100% sure the shrubs I have in my yard are fine to use as edibles. I am very new to foraging. Thank you. Is it possible just to put the flowers into the honey? That way it would last longer?